It was in the Summer of 1929 that a small, ruddy faced man on holiday from Paris made the journey up to Val d'Isère. The road, perhaps better described as a donkey track, was perilous. Threatened by avalanches from the surrounding peaks during the winter and by stone falls and mud slides in summer. Only a few brave souls came this way in the early spring months, climbing skins fixed to the bottom of their skis. What greeted Jacques Mouflier was a verdant, hidden valley, barely emerging from the subsistence agriculture of the middle ages. 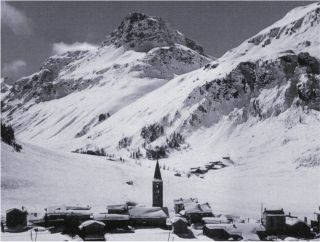 Val d'Isère was huddled around its 17th Century octagonal church spire, far from the reach of deadly winter avalanches. A lush pine forest separated the 5km to Fornet?. Legend had it that this village had been occupied since the middle ages by Sarrisans, mineral prospectors in the surrounding mountains. Lower down the hamlet of la Daille was dominated by the mighty Bellevard peak. High up towards the border with Italy glaciers twinkled in the summer sun. At that time the valley had just four hotels, the Auberge Morris dating from 1888 followed by the Parisien in 1900 and the Bellevue in 1919. These were open only in the summer for the benefit of botanists and walkers. Water came straight from the mountain streams and the telephone and electricity were unknown. Mouflier saw the potential for developing a ski resort but lacking the money of the Rothschilds in Megève he had to set about convincing the locals. In 1932 the Hotel de Paris opened for the winter and in 1936 the first drag lift was built on the slopes of the Solaise mountain. But the station was really put on the map in 1937 when Pierre Cot and Leo Legrange, two government ministers on an official visit were trapped in the resort by four meters of snow. That same year, Europe's highest road pass, the Col d'Iseran was opened by the French President beside a beaming Mouflier. 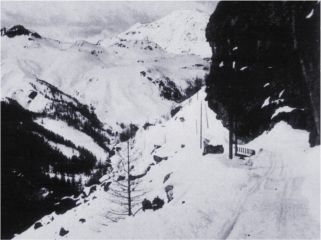 In those distant days before widespread road transport not everyone was convinced by the idea of creating a ski resort in such a remote valley, far from the towns and cities that would provide skiers. In 1938, work started on the first cable car, the Téléphérique de Solaise. Jean Matter, president of the French Ski Federation (FFS) predicted that "it is utter madness to build a ski station at Val d'Isère, failure is certain!" History has proved otherwise. At the end of the 1960s an agreement was reached between the lift company (STVI - Société des Téléphériques de Val d'Isere) and their neighbours at Tignes (STGM - Société des Téléphériques de la Grande Motte). A lift was opened at la Daille in linking the two resorts and in 1972 links were opened with the Fornet sector. The area is known as l'Espace Killy after Val d'Isère's Olympic hero Jean Claud-Killy who picked up a record 3 medals at the 1968 Grenoble Winter Olympics. Years of largely uncontrolled development resulted in a number of deaths in avalanches during the winter of 1970 including 39 children as they ate breakfast in the UCPA chalet. The development had taken its toll on the once charming village. The 1992 Albertville Winter Olympics were a spur to redevelopment in a more Savoyard style with the use of Lauze (stone roof tiles) quarried from the Manchet valley. The Face du Bellevarde was used for the men's downhill race as part of the games with the Daille funival, the first of its kind in France, providing rapid access to the summit.